Did you realize that the color of your lipstick directly correlates with how white your teeth look? It's true. If you go out and try on a few different colors, and take a picture with each different color on, you will notice a huge variance among the pictures in terms of how white your teeth appear. Most people find reds through purples to be the most appealing, while oranges are the least. This is because orange gives your teeth an unhealthy yellow glow. 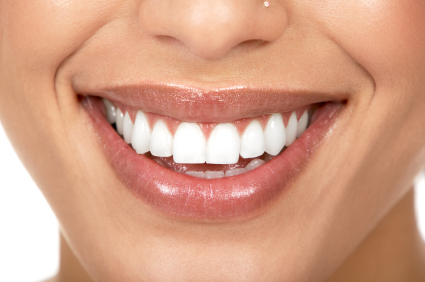 One of the easiest ways of keeping your teeth looking white is to avoid yellow or orange lipstick. It leaves your teeth looking dark, and gives them an orange hue. Even if your lipstick is not a full orange or yellow shade, if the base is either of these colors, such as an orangish-red, you can get the same effect. Another thing you can do is to make sure you eat produce as often as possible, and ideally raw or lightly cooked. The point is you want produce that takes time to chew up. This helps to scrub some of the stains off your teeth, and gives them a whiter, healthier appearance. Plus, your mouth gets really good nutrients when you make produce your main consumable each day. If you want help brightening up your smile, we are the place to turn. Let us examine your mouth, and let us decide which method of tooth whitening is best for you. Some dentists think that doing it in the office is best, since they can directly control how much whitening you get, while others believe the comfort of your own home is a more ideal situation. Listen to our suggestions, and get the whiter and brighter smile you were hoping for now. If you have any questions, or if you would like to learn more, please call us today at (425) 998-6998.